After many hours of research, discussion at the Rootschat forum (see A Harper Family Conundrum) and a substantial amount of head scratching, I believe that Wilfred Eric Harper was born William James Harper. The best way I can provide support for this conclusion is by noting the information that we have, in point form. 1. The information that was passed to living Harper family members was that Wilfred was 46 at the time of death – not 52 as stated on his death record (more about why that may have happened shortly). Birthplace is listed as ‘Ballarat’ but was most likely Riddells Creek. There is no birth record in Victoria for a Wilfred Eric Harper. 2. On his death record, Wilfred’s parents are listed as Samuel Harper and ‘Norah’ Harper (nee Ryan). The mother’s name is most likely a spelling error as all records we have found suggest that the mother was Honorah Harper (nee Ryan) who was married to Samuel Harper. The informant on the death record was a ‘registered agent’ rather than a family member. 3. William James Harper was born in 1875 which would put his age at 46 when Wilfred died in 1921. His parents were Samuel and Honorah Harper. 4. William James Harper married Annie/Anna Maria Smith (maiden name Fraser) in 1900. She was 12 years older than him at that time and had 3 children. She was the widow of John Philip Smith. Birth and marriage records confirm these details. William and Annie had 2 children of their own – George Eric (b. 1902) and Ira Charles Norman (b. 1905). According to information passed on from a descendant of William/Annie, William deserted Annie shortly after the birth of their second child. He travelled to Tasmania where he set up a Barber/Tobacconist business. 5. According to a newspaper report from 20 Feb 1907 (http://trove.nla.gov.au/ndp/del/article/10617152?searchTerm=harper%20%20riddells%20creek&search Limits=), William E Harper was arrested (in Bourke Street, Melbourne apparently) for ‘deserting his wife’ and theft of a pair of hair clippers. He spent around 6 months in jail – the record states that he defaulted on his maintenance payments to his estranged wife (5/- per week) and was to be ‘imprisoned indefinitely’. He was charged on Jan 23 1908 and released on July 11 1908 – the reason given was ‘To Freedom Special authority’. 6. According to Rachael May Johnston’s official death record, she married Wilfred Eric Harper in Coburg, Melbourne in 1907 when she was aged 17. There is no marriage record for Wilfred and Rachael. 7. There is a record from 1903 that shows William Ernest Harper on the Riddells Creek electoral role, listed alongside Honora Harper and Annie Maria Harper. There is no record of a William Eric or William Ernest on the electoral roles after that time. 9. 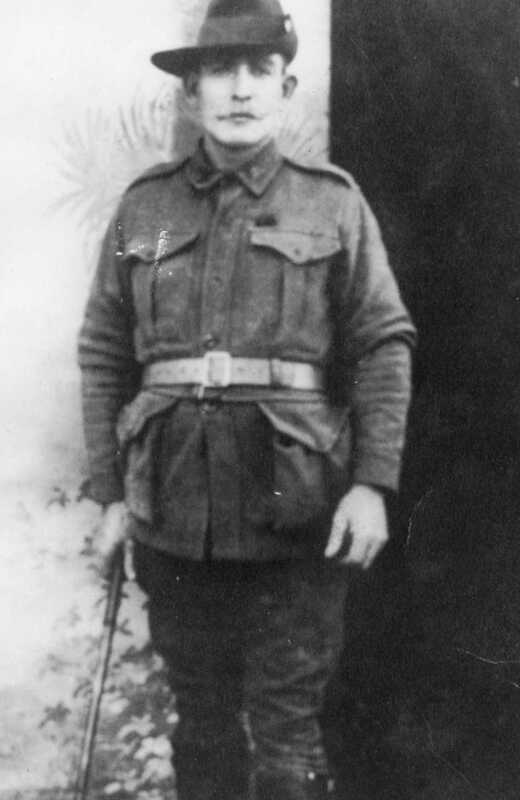 On Sep 27 1915, Wilfred Ernest Harper enlisted to fight in World War 1. His wife was recorded as ‘May’ Harper – most likely Rachael May. The age at the time of enlistment says 46yrs and 5 months. William James Harper would have been 40yrs and 5 months. There are a few theories as to why he may have given incorrect information – but I believe this may be why the death record states his age at 52 in 1921. It may be that the person compiling that information used the statement of his age from his enlistment papers. We do know that our Wilfred Eric was in WW1 as he was allocated a soldier settler block at Red Cliffs after he returned to Australia. 10. The enlistment form for Wilfred Ernest states his height at 5ft 6 1/4 inches with grey eyes. The prison record for William E Harper states his height at 5ft 6 1/2 inches with grey eyes. 11. After the death of Wilfred Eric/Ernest in 1921 the armed forces sent the medals to his widow. That widow was not ‘May’ Harper as recorded in his enlistment – it was Annie Maria Harper, the wife of William James Harper. 12. The birth record for Charles Wilfred Eric Harper (my grandfather’s younger brother) states that his mother was Rachael May Johnston and his father’s name was William Ernest Harper. There are a number of other snippets of information that add to this interesting story, but I believe that we are about as close as we can get to the real story without building some sort of time machine. There is a lot in there that links William James/Ernest To Wilfred Eric/Ernest. We’ll never know the entire story or all of the facts but it certainly makes for an intriguing (and we hope, mostly solved) mystery. Hello. I was astounded to find this having toyed with the idea of researching some family history for some time. My son was asking me for some family background for a university assignment and I Googled my grandfather only to find that this man (Wilfred/William/Ernest/Eric) is him! I have this very same photo of him framed in my house! My father was his son Leslie Rex Joseph Harper b 1919. I was born on his 40th birthday in 1959. I would love to discover anything else about the family as the only other family member I had anything to do with was my auntie Kathleen. It would be great to make contact with you and I’m sure my sister Jenny would love to know more about our family too. Please contact me at the email address above. Harper Family Tree © 2019. All Rights Reserved.